Stick a couple of Clever Hem® inside your jeans. Clever Hem® has a double adherent surface protected by an easy-to-remove liner. Fold your hems at the desired height. Clever Hem® helps not to sacrify seams nor time to adjust the length of your trousers, and moreover you can use it many times. Don't spoil more trousers. 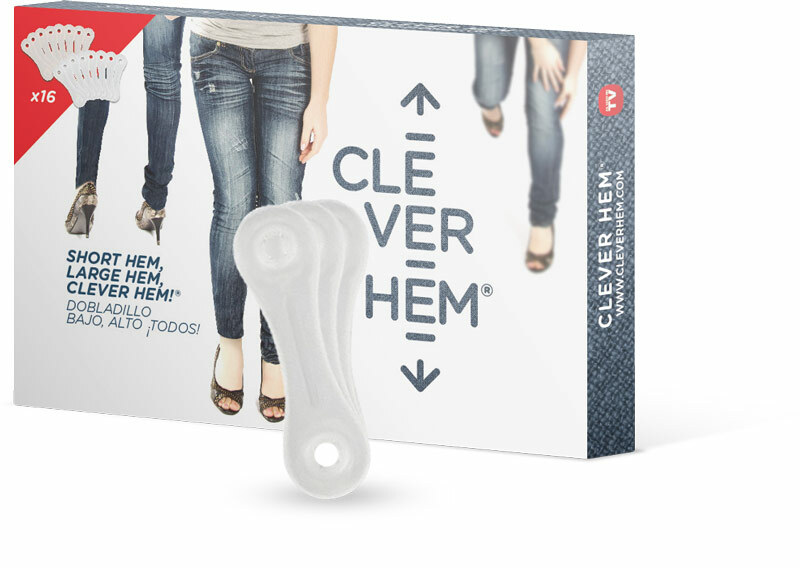 Thanks to Clever Hem® you will be able to adjust the heigth of your hems without sacrifying your clothes. Clever Hem® is just fine for all kinds of trousers. Each box includes 16 units. Thank you for your interest. Please fill in properly the following fields. Please note that all the fields are required! Thank you for your message! We will reply soon. The message could not be delivered. Please try again in a few moments. Please check you've filled all the fields properly. Clever Hem® and its logo are registered trademarks. All rights reserved 2013. Contact.